You improve flavor and moistness by brining chicken before cooking it in your smoker or on your grill. Using this little cooking technique makes it a lot easier to consistently serve juicy and flavorful chicken to yourself and your guests. 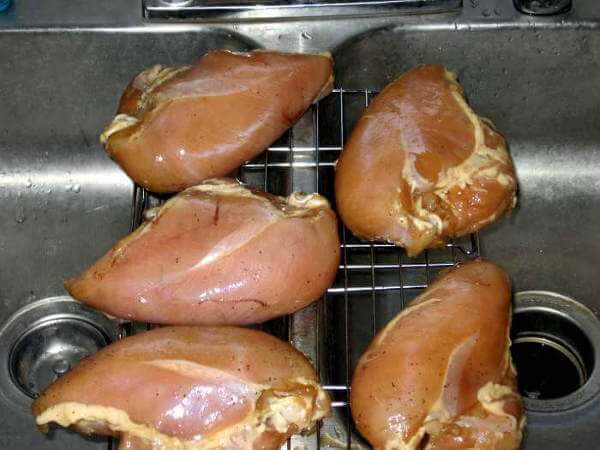 Brining is a good thing to do to all poultry, but it's especially useful when cooking white meat. When grilling or smoking the dark-meat thighs and drumsticks, overcooking isn't really a problem. Dark meat remains moist if cooked too long. The white meat of breasts, on the other hand, suffers badly when overcooked. When exposed to too much heat, the white meat fibers contract, squeezing out much of the internal moisture. And when that happens, the chicken is less juicy and more chewy. Chicken can be brined whole, halved, or in pieces. Thicker, larger pieces need to remain in the brine longer. Leaving the skin on also requires longer brining time. Whole or halved chickens with the skin left on need at least 2 hours, and up to 4 hours in the brine. Longer brining time will make the chicken more salty to taste. More time in the brine will also help keep the chicken more moist, too, so adjust the time accordingly. Cut up chicken with skin on needs about 2 hours in the brine, legs and wings a little less. When skinned, those same pieces are OK after 1 to 1-1/2 hours of brining. Rinse the chicken well and dry it off before grilling or smoking. Also, use the given times as a guide, and adjust the brining time to please your own palates. 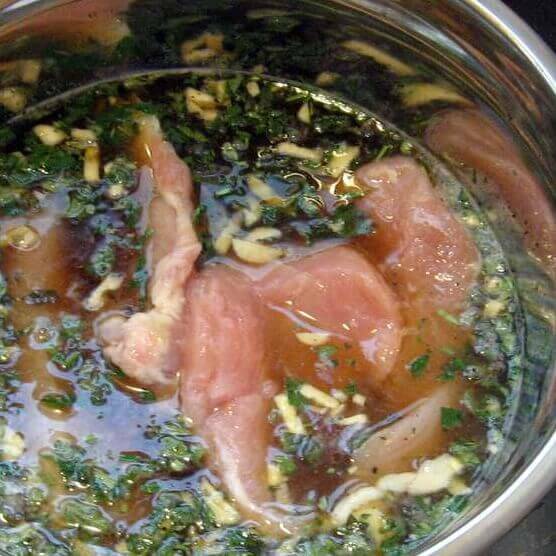 I place skinless, bone-in chicken breasts into a bowl of cold brine. The brine has been chilled down to below 40 degrees Fahrenheit with ice. If it's not below 40 degrees, the chicken will begin to spoil. Next, the bowl is placed into the refrigerator for the prescribed time. I left these brining for a full 2 hours, since I don't mind food that's a little on the salty side. Being in the refrigerator ensures that the chicken won't begin to spoil. After brining, the breasts were rinsed off, patted dry with a towel. Season with a dry rub before smoking.